Bangkok is in the midst of another round of street demonstrations. This time it’s the Red Shirts vs the government. In the past it was the Yellow Shirts against the previous government. The Red Shirts support ousted Prime Minister Thaksin Shinawatra, the first Thai Prime Minister popularly elected to two terms. In 2006, the Thai army ousted Thaksin in a coup and the Thai courts banned his party. In the 2007 elections that replaced the military government (that ousted Thaksin) Thaksin’s new party won (Thaksin, now a felon in Thailand didn’t run. Instead his proxies were on the ballot). The so called Yellow Shirts took to the streets and the courts ruled that the new party was not really a new party and was made up of Thaksin’s cronies and took orders from Thaksin. All of which was true. So they ordered the new democratically elected government to step down. Which is how the current PM, Abhisit Vejjajiva came to be the Prime Minister of Thailand. Now it’s the Red Shirts who are in the streets protesting. Most of the protests are in the old part of Bangkok, well away from the city’s commercial centers of Sukhumvit and Silom. But some of the protests have disrupted the routine of tourists who like to visit the temples and Palace in the historic part of Bangkok. Some observers fear Thailand is on the brink of civil war. Certainly these are dangerous times in the Kingdom. Grenade explosions and attacks launched from M79 grenade launchers (a relic of the American wars in Asia) are common place. It’s important to note that none of these attacks have taken place where there were large crowds or in areas used by the expat community. In fact, they usually happen late at night or early in the morning in relatively remote areas or around closed government buildings. I think they are meant to scare people rather than kill people. Today’s protest was supposed to be a rally at the protest headquarters in old Bangkok. But organizers decided to turn it into a march. Which turned into a motorcade, which turned into 10 or more motorcades. I started following what I thought was the main part of the march and after about two hours we ran head on into another group of marchers coming from some other part of town. It was all very confusing. The intersections where they met were completely gridlocked. And it was about 95 degrees and we were in the only part of Bangkok that doesn’t have convenience stores on every corner, so there was no water available. Eventually the motorcades that came together splintered and I found myself in a part of Bangkok I hadn’t been in 40 years, since we lived here. Which meant I was completely lost. But I never felt like there was any risk or danger. The protestors were a very cheerful bunch. And they seemed to really like Americans. Several times people asked where I was from, when I said America they started slapping me on the back yelling “Obama” and then asking that we (foreign journalists) tell the world what is happening in Thailand. One woman gave me a hat (because I stupidly left mine in my apartment). Countless folks offered me rides on motor scooters. Which I turned down. The air was more festive than anything else. I have no idea when or how this is going to end. The Red Shirts are funded by Thaksin who has billions to spend. I’m not sure the government can count on the security services to break up the protests if it comes to that. Today the police were cheering for the protestors, giving them water and generally supportive. 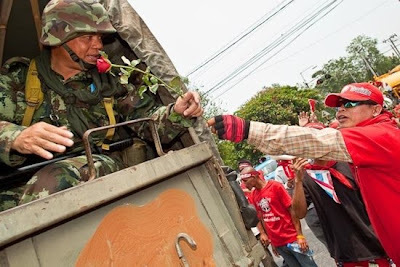 The soldiers accepted flowers from protestors and shook hands with them when the Army was pulled out of several checkpoints. The Army opened fire on protestors in April 2009 during a similar series of marches. Whether or not it will come to that no one knows. For their part the Red Shirts plan to push this to the end, whatever that means. The protests have been smaller than predicted. At one point, the Reds said 1,000,000 people would come to Bangkok. It never reached that. They had just over 100,000 last week (before I got here) and today’s crowd was about 80,000. But what they lack in numbers they make up for determination. This was supposed to be a long weekend of marches that were supposed to end around March 21, last week. Then there were small demonstrations through the week (including one where they threw blood at the Parliament and Prime Minister’s home). Now they’re not saying when it will end. This may well be Thailand’s Year of Living Dangerously. There are more photos of the protests available from ZUMA Press or in my PhotoShelter archive.